One of the worlds greatest archaeological collectionsroyal jewelry, musical instruments, tools and other artifacts from 4,500-year-old burials in the Sumerian city-state of Urare on display from Oct. 21 through Jan. 21, 2001 in the galleries of the Oriental Institute. The exhibition is sponsored by the Pew Charitable Trusts. The national tour of the exhibition, Treasures from the Royal Tombs of Ur, was organized by the University of Pennsylvania Museum of Archaeology and Anthropology, whose archaeologists unearthed the material. A great lyre, one of the oldest musical instruments known, has a sound box that is ornamented with the head of a bull, which is made of gold and lapis lazuli. 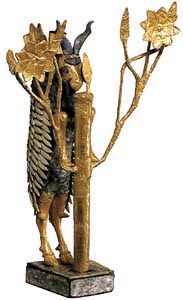 The collection includes artifacts that have become standard pieces in the study of art history, such as a piece known as Ram Caught in a Thicket. This particular artifact is a statuette of a goat that is fashioned from gold, silver, lapis lazuli and other precious materials; its forelegs rest on a gold-covered tree. 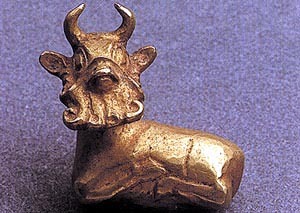 Another piece is an exquisite bull-headed lyre. The material, which was discovered in the 1920s, is touring the nation for the first time while the University of Pennsylvania Museum undergoes a renovation. The Sumerians were creators of one of the worlds earliest civilizations, one that flourished in Mesopotamia, located between the Tigris and Euphrates rivers in what is now Iraq. Their culture emerged in 7000B.C. and by about 3000 B.C., a system of city-states emerged to control the area. They were among the first people to invent writing, using cuneiform script on clay tablets. As the region was poor in natural resources, the Sumerians established an extensive trading system to supply wood, stone and other raw materials. That trading system reached Egypt, Turkey, Iran, the Persian Gulf, Central Asia and India. 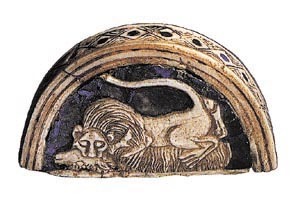 Precious and semi-precious stones as well as gold also were imported from distant places, and those materials were fashioned into the goods found in the tombs. About one-third of the 157 items in the exhibition come from the tomb of Queen Puabi, who was buried with her servants. The burial party was dressed in jewelry and apparently had been celebrating an elaborate feast just prior to being buried together. Puabis tomb held the bodies of five armed men, four grooms accompanying a wooden sledge drawn by a pair of oxen and more than a dozen other attendants. The Sumerian queen was laid to rest wearing an elaborate headdress of gold leaves, gold ribbons, strands of lapis lazuli and carnelian beads, a tall comb of gold, chokers, necklaces, a pair of large crescent-shaped earrings, and a cape composed of strings of semi-precious stones. An ornate diadem made of thousands of small lapis lazuli beads with gold pendants of animals and plants also was found near her head. Nearby was a collection of cosmetic containers, including one with an elaborate shell lid decorated with silver and lapis lazuli. 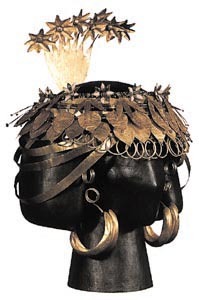 Those objects as well as the headdresses are among items in the exhibition. Puabis tomb was among 1,800 burials excavated at Ur, a city identified in the Bible as the birthplace of Abraham. The excavations were carried out by a joint expedition of the British Museum and the University of Pennsylvania Museum and led by famed British archaeologist C. Leonard Woolley. Woolley considered 16 of the burials to be royal because they contained such a wealth of precious materials as well as the bodies of attendants accompanying the main burial. A vessel in the form of an ostrich egg; gold, lapis lazuli, red limestone, shell and bitumen. 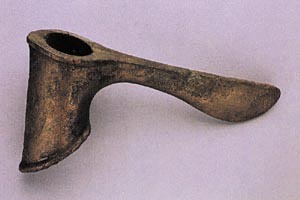 The material being exhibited dates from 2600 to 2500 B.C., when Sumerian culture was at its zenith. The splendor of the treasures from the tomb of Puabi are comparable to those from the tomb of the Egyptian king Tutankhamen, which also was discovered in the 1920s. Yet Puabis tomb predates that of Tutankhamen by more than 1,000 years. The statuette called Ram Caught in a Thicket caught attention at the time of its discovery because Woolley associated it with the ram caught in a thicket in the biblical story of Abraham and the intended sacrifice of Isaac. The bull-headed lyre is an important piece because it is a reconstruction of one of the worlds oldest musical instrumentsa large wooden lyre decorated with gold, lapis-and-shell inlays and a bulls head made of sheet gold with tufts of hair and a beard of lapis lazuli. The lyre was found near the body of a musician who may have performed during the burial ceremonies. 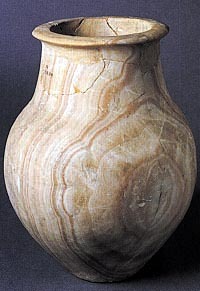 Other artifacts in the collection include vessels of gold, silver and calcite, which is a pale translucent stone. 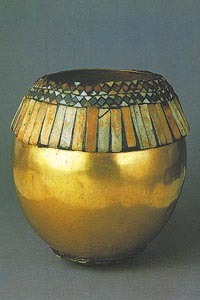 Among the items are gold bowls and fluted tumblers made of electrum, which is an alloy of gold and silver. Also appearing in the exhibition are tools and weapons made from gold, silver, electrum, copper and copper alloys. The items include spears and daggers as well as a razor and tweezers. The Oriental Institute is among the worlds leading centers for the study of the ancient Near East and the home of one of the greatest concentrations of specialists in the languages and history of ancient Mesopotamia. The Oriental Institute galleries are currently undergoing complete renovation. On Sept. 9, 1999, the Joseph and Mary Grimshaw Egyptian Gallery, devoted to the art and archaeology of Persia, opened to the public. The Oriental Institute is open from 10 a.m. to 5:30 p.m. Tuesday through Sunday; and from 10 a.m. to 8:30 p.m. Wednesday. The galleries are closed Mondays. Admission to the permanent installation is free, but a donation is suggested for viewing Treasures from the Royal Tombs of Ur. An extensive public-education program for adults and children supplements the exhibition. For more information on the public programming for children and adults, call (773) 702-9507 or visit http://www-oi.uchicago.edu/ur.html.